Share this guide with caregivers to facilitate a conversation about falls risk factors and empower caregivers to develop a falls prevention action plan. Tom is a 71-year-old veteran who took control of his health after being diagnosed with diabetes. He was impressed by a Diabetes Self-Management Program that gave him exactly what he needed. “It got me off the couch—I’m interacting with people, I’m learning all the time, and I’ve changed my daily life habits,” Tom said. In 2017, more than 55,000 seniors like Tom participated in evidence-based healthy aging programs supported by NCOA in communities across the country. You can make #SeniorHopes like Tom’s come true by donating today! Thank you for your generosity. A new descriptive study published in the International Journal of Environmental Research and Public Health examined the geographical reach of Chronic Disease Self-Management Education (CDSME) programs. Read the findings and strategies to reach remote areas and serve diverse communities as the aging population continues to grow. Congress has several pieces of must-pass legislation to address this month. Key priorities for healthy aging programs include a deal to raise the budget caps to allow FY18 appropriations to finally be wrapped up and passage of health extenders including continued low-income Medicare outreach funding. Last week, Congress passed another Continuing Resolution (CR) to keep the government running through Dec. 22, with the expectation that many of these issues would be resolved in a massive legislative package passed on or shortly before that date. However, signs are now pointing to another delay that includes a third CR of the year, perhaps running through Jan. 21. The immune system naturally weakens with age, which means winter can be even more dangerous. 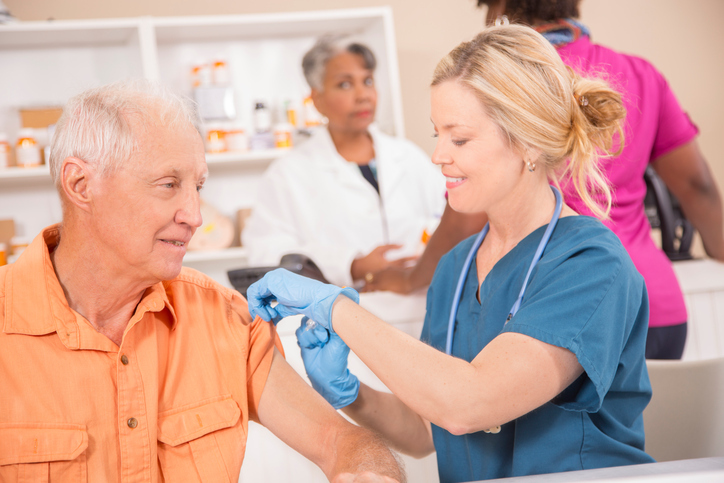 Encourage older adults to protect themselves from influenza, shingles, pneumococcal disease, and hepatitis B, all with vaccines covered by Medicare. Winter weather can lead to devastating slips, trips, and falls. Consider these five “winterizing” steps to reduce falls among older adults and adults with disabilities in your community. Recommendations include winter adaptations to shoes, boots, and assistive devices, and a list of fall-proof holiday gifts. Use this infographic developed by the Movement Advancement Project, SAGE, and the Diverse Elders Coalition to provide support to LGBT older adults during the holiday season. The infographic is designed to help isolated or lonely LGBT older adults know that they are not alone—and to give them options of where to go for help. Apply for opportunities through the Advanced Rehabilitation Research and Training (ARRT) Program: Learn more about several opportunities through the AART program to increase capacity for high-quality rehabilitation research. Mac, Inc. and Peninsula Regional Medical Center (PRMC) honored as Population Health Innovators of the Year: Learn more about MAC Inc. and PRMC’s innovative initiative to expand access to evidence-based self-management programs in communities with higher chronic disease prevalence and other health disparities. New research on preventing falls: Read this summary in Consumer Reports about the most effective strategies for preventing falls among older adults. Global Taking Diabetes to Heart survey: Share the International Diabetes Federation’s survey to assess awareness about cardiovascular disease among people living with type 2 diabetes. Older adults are taking too many unneeded drugs: Read this article from Kaiser Health News, about the challenge of ensuring that older adults are not taking prescription medications that are unnecessary or potentially harmful. 5 helpful hints for celebrating holidays with a person with Alzheimer’s: Share these helpful hints to make celebrating the holidays an enriching time for all. Guidebook for Mental Health Caregivers: Download this guide for unpaid caregivers to find help for common challenges such as finding the right provider, getting the right diagnosis, and planning for the future.